Das Buenas Vibras Hostel ist dein Platz in Montevideo! Aufgrund seiner optimalen Lage kann man alle wichtigen Anlaufpunkte schnell erreichen: Es sind 5 Gehminuten zum Strand und zur Rambla, 20 Gehminuten zum Busbahnhof, 15 Minuten zur Innenstadt und es befindet sich im Herzen des trendigsten Ausgehviertels in Montevideo. We loved to stay in his Hostel! Nice Asado, very nice and helpful people working here! Most comfortable beds in the last days! I loved my stay there, Matty and the rest of the personal are very nice and helpful (disadvantage: mostly English speakers). good 25min to the center & bus station, but everything you need near. Very good empanada shop around the corner (try it!!) there's a outside place in the summer where's super easy to meet people :) sometimes there's a asado, breakfast was rlly good (no-pulver coffee, fruits, cornflakes & milk, white & integral bread a.o.) highly recommended, one of my best stays in LA!! Sehr schönes, zentrales Hostel mit Garten. Zu Fuß oder Fahrrad(im HOSTEL) ist eigentlich alles erreichbar und Bank, Supermarkt und Kneipen befinden sich im Umkreis von 5-10 Minuten. Die Mitarbeiter sind sehr freundlich, da viele selbst freiwillige Helfer sind, die selbst auf Reisen sind. Wir hatten das Glück beim Hauseigen Assado mitessen zu dürfen, welches wirklich sehr zu empfehlen ist (350Peso). Leider wird das Frühstück mit Aufpreis von 2$ angeboten. Küche ist klein aber ausreichend. I really enjoyed my time at the hostel. The atmosphere is great. I met some great people. 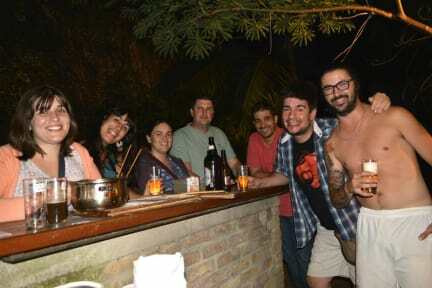 And the Asado was so good! It was all allright. Comfortable beds and nice staff. Only point, not so clean. The cleanliness could be improved. 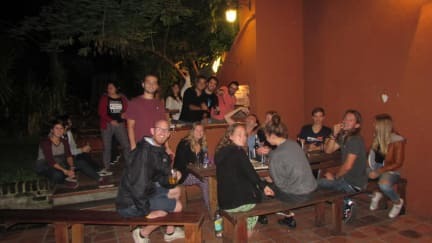 The hostel wasn't very busy, but the few people that were there were very open to doing stuff together as everybody meets in the garden, so the atmosphere was quite all right. Brandon, who worked at the reception was nice and helpful. The location seemed okay, not in the old town, but the old town anyway wouldn't be a place I'd to stay in. Montevideo in General doesn't have much to offer and to me is a city that you could easily skip.